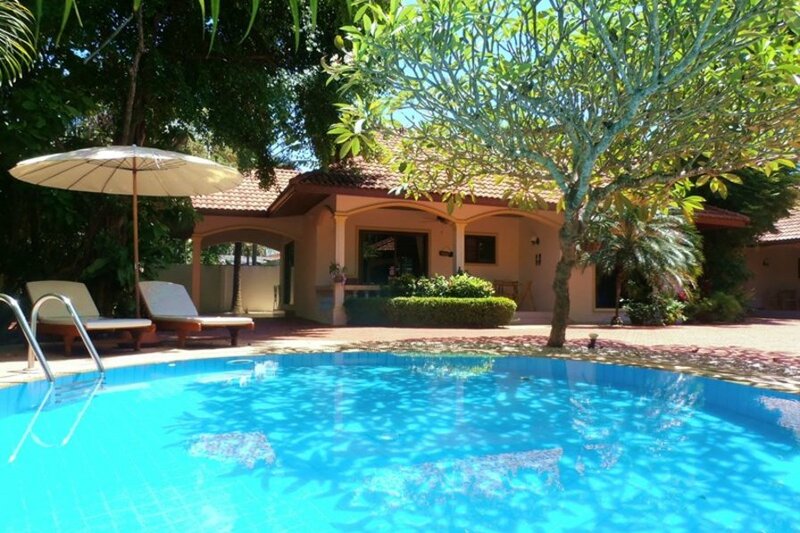 "COCONUT BEACH" is a "PEACEFUL HIDEAWAY" 2 Bedroom Villa Sitting with Two other Similar Villas Around a Beautiful Secluded Pool which is Private to The Three Villas in the Lush Tropical Grounds of "COCONUT PARADISE". Close to Idylic Small Tropical Islands, Powder White Sandy Beaches and Crystal Clear Water for Swimming and Diving. "COCONUT BEACH", "COCONUT LAGOON" AND "COCONUT PALMS" are Three Beautiful 2 Bedroom Villas with Their Own Private Pool and Beautiful Private Tropical Garden. They can be Booked Individually and are also Ideal if Booking 2 or 3 of The Villas for Groups of Family or Friends Wishing to Holiday Together but Retain Their Own Privacy. "COCONUT BEACH" has a Spacious Open Plan Living Room Adjoining the Kitchen and Opens onto the Attractive Terrace which is Perfect for Al-Fresco Dining. The Kitchen is Fully Fitted with Hob and Extractor Hood, Microwave, Fridge Freezer, Automatic Washing Machine, all Essential Equipment and a Safe. The Living Area has Flat Screen TV with 50 Channels on Cable, a CD/DVD player, Wi-Fi Internet and a Mobile Phone with Local Sim Card. The Spacious Master Bedroom and the Twin Bedroom both have Patio Doors to the Garden. The Villa has an attractive Fully Fitted Shower Room. The Villa has Ceiling Fans, Fly Screens and Full Air Conditioning Throughout. The Living Area, Kitchen and Dining Terrace all Overlook The Beautiful Pool and Gardens. There are Comfortable Sun Loungers for Relaxing by The Pool and also a Car Port. We Offer a Full and Personal Service Including Arranging your Airport Transfer and Car or Motorbike Hire which can be waiting at your Villa on Arrival, We have our own Tour Specialist who can Advise you and Book any Tours, Excursions, Boat Trips to other Islands etc. We can Book Massage for you in the Privacy of your Own villa and we also offer Free Delivery of Meals, Wines etc. from our own Excellent Bar and Restaurant on Rawai Beach Front. When you Arrive, we offer to take you on a Short Complimentary Tour of our local area , showing you the Best Beaches, Bars, Restaurants, Shops etc. so you can enjoy your holiday right from the minute you arrive. We Welcome you to experience a Special Holiday at "COCONUT PARADISE"